A Michigan Deed of Trust is a guarantee between a lender and a borrower – while installing a trustee as an intermediary – that pledges the interest in a parcel of real property to secure the proceeds of a loan, or promissory note. Download a free Michigan Deed of Trust that you can customize with your own personal information and print online. A Michigan Deed of Trust is commonly used by lenders and requires the borrower to provide title to the property being acquired as collateral for the loan amount. A Michigan Deed of Trust is sometimes called a Michigan Trust Deed. How does a Michigan Deed of Trust work? The lender loans the borrower a certain amount of money for the purchase of a piece of property. Through the application of a Michigan Deed of Trust, the borrower will then transfer title of the property to an independent trustee, who will hold the title until the debt is repaid to the lender. Once the note is paid in full, the trustee will then assign the title to the borrower. If the debt is not repaid, the lender notifies the trustee, who then implements non-judicial foreclosure proceedings to recover the debt. A Michigan Mortgage Deed and a Michigan Deed of Trust are similar in that both act as security for the repayment of a loan by liens placed on the property. When taking out a Mortgage in Michigan, there are only two parties involved – a lender and a borrower. A Michigan Deed of Trust, however, is comprised of three parties – a lender, a borrower and a trustee. When taking out a Michigan Mortgage Deed, if the borrower cannot repay the loan, the lender will commence judicial foreclosure, file a lawsuit against the borrower and take the case to court, costing everyone involved a lot of time and money. With a Michigan Deed of Trust, the trustee, once notified of delinquency on the note, will start non-judicial foreclosure proceedings to recoup the lender’s investment without the added expense of going to court. Both Mortgage Deeds in Michigan and Michigan Deeds of Trust, once transferred, must be recorded in the local records office and are in the public domain. A Michigan Deed of Trust is a viable alternative to a Mortgage in Michigan because of the non-judicial foreclosure process used when borrowers cannot repay the note on the property. Non-judicial foreclosure, when compared to the judicial foreclosure process used when taking out a Mortgage in Michigan, saves all parties the certainty of excessive legal fees and lengthy court proceedings. We show you how to fill out a free Michigan Deed of Trust, customized with your information, and printed out in minutes online. 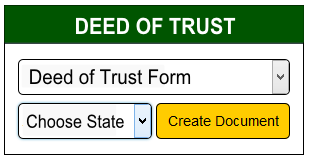 Fill out and print a Michigan Deed of Trust online. Click here to start today for free.